My back was doing so much better. My physical therapy had been done for awhile. I was still doing the exercises and stretches I had learned. And, I was up to walking an hour at a time at a pretty good pace with no pain. I had no visions of trying to run again. I wasn't even thinking about that. I just want to keep getting stronger. And then, I lost ground. Big time. You see, I decided to mow the lawn last Saturday. I always used to mow before the discs in my neck were bulging onto nerves last summer and those in back protested this spring. I used to enjoy mowing. Really. It always made me feel like I was accomplishing something quickly, plus I gained the immediate gratification of having the lawn look much better. And, I got a good workout. So, last Saturday afternoon, it was a go. I knelt down by the mower to pour the gas in, taking care not to stress my back. 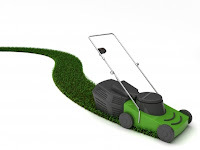 The mower started easily, so that was OK. As I walked behind the mower, everything felt great. Maybe half way through, I started to notice that when I came to the end of a row, I could feel my back just a little as I stopped and turned to go the other way. No real pain, just a little twinge or something. It just kept going like that and didn't get worse, so I just finished up the lawn. When I was done, I was exhausted but proud that I had actually done it. I did it alright. As I showered, I started to realize my back was mad at me. Pain. It was telling me how it truly felt about mowing, and it wasn't positive. After getting dressed, it was time for lots of stretching. Then ibuprofen and rest. It's a week later now. I feel like a lost few weeks of progress with the mowing episode, but I will persevere. Still some pain now and then. I'm working on the stretching doing all the back strengthening exercises faithfully. I'm being very carefully not to twist, bend or distort my back. And, I'm choosing my activities wisely. Time and patience. OK. I've got it. I need to LISTEN TO BY BODY! Lesson learned. I hope. By the way...my husband mowed the lawn today!